Hamas official refuses to comply with Palestinian Authority's demand to disarm Gaza militias. 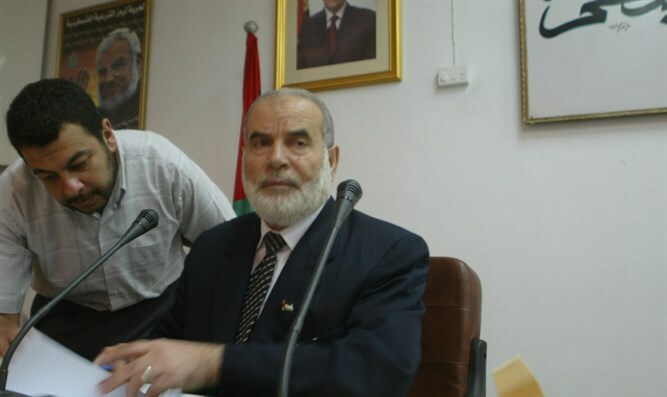 Senior Hamas official Ahmed Bakhar rejected the Palestinian Authority's (PA) demand that Hamas disarm its militias as part of the recent PA-Hamas reconciliation agreement. In October, Hamas and the Palestinian Authority's leading Fatah party signed a full reconciliation agreement, ending a decade-long split. In a Friday sermon at the Al-Makhteh mosque in Gaza, Bakhar said that the PA's implementation of its power over Gaza would be in removing the "siege," cessation of Gaza's security communications with Israel, and the payment of salaries to those working in Gaza's public sector. Bakhar also warned the PA not to harm Gaza's weapons arsenals as part of the "deal of the century" initiated by the US administration and intended to solve the PA's crisis with Israel. Any weapons used in the "battle" are legitimate, he said, since they are intended to "reinstate the rights" of "Palestinians" and to "free" the "conquered land." This, he claimed vehemently, is an international right. Bakhar also warned several Arab and Islamic groups that the "deal of the century" should not normalize the "Israeli occupation." According to him, the single and fastest way to "free the land" and reinstate the "Palestinians'" rights is through the use of arms.